Choo-choo! 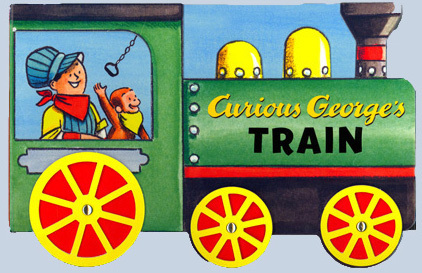 Come along for a ride in Curious George’s Train—an innovative novelty book that’s shaped like a train! George and the man with the yellow hat are going on an old-fashioned train ride, and George can’t wait to climb aboard. Curious little ones will love exploring the train with their favorite mischievous monkey. Then it’s up to them to set the scene and lay the tracks for hours of interactive fun! 9 x 6". Ages baby - preschool.